Beth Tfiloh is considered one of the premiere Kosher catering facilities in the Baltimore metropolitan area. Our list of approved Kosher caterers includes those who are under the supervision of the Vaad HaKashrut of Baltimore. Get more for your wedding! 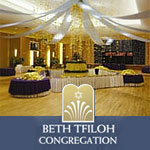 Don't forget to mention ChossonKallah.com when visiting Beth Tefiloh Congregation.